Businesses small and large spend a lot of time and money to ensure that their employees have the communications system they need to work effectively. Nobody wants to see those investments go to waste, that's why it's important to design a long-lasting and effective infrastructure to support business needs for the long-term. Sales and customer relations suffer when a business can't be reached. This can happen for several reasons, such as an outage or natural disaster. Your systems need to be set up to handle these circumstances, as well as any challenges from high-volume call times, temporary relocations, and remote workers. With Commworld's cloud communications, you're on the right path to addressing these types of situations. During our initial consultation, we work with you to find the right combination of solutions for your business. This includes a discussion of future needs and a review of the current infrastructure that you have in place. We often recommend cloud disaster routing, which allows you to easily forward critical phone numbers to smartphones, allowing customers and partners to still reach you without dialing a different number. In addition, you can have voicemails stored on the cloud for easy access even when you're not in the office. 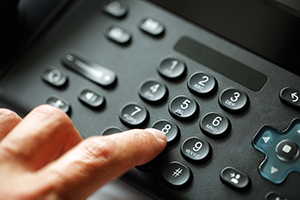 Thanks to our cloud communications, we can help your phone system adjust - no matter the situation.